From its opening in 1803 and for many years to come, the character and management of the RMA was strongly influenced by the experience and practice of the RHMS, Phoenix Park. This should not come as a surprise. The authorities modelled the interior economy of the new institution on that of the Hibernian School. They based their regulations and staffing requirements on those of the Hibernian Institution. In fact, from the research being done by Howard R. Clarke, it is becoming increasingly obvious that the two schools had more in common than differences to set them apart. When the RHMS vacated its premises in Phoenix Park in 1822 and moved to temporary accommodation in Shorncliffe, its regimental colours, and a stained glass window from the Anglican chapel were among those important school possessions removed. 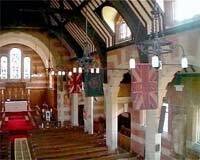 The school colours now hang in the school chapel at the Duke of York's Royal Military School with which the Hibernian School was amalgamated in 1924. The maginificent stained glass window also occupies a prominent position near the entrance to the chapel. 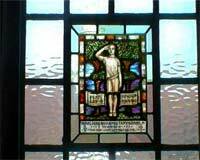 Thanks to Howard Clarke, we are able to show digital images of the Hib colours and stained glass window, which he took during a recent visit to the School in May 2004. Thanks also go to Michael Carson, head of the History Department, who accompanied Howard during his visit. 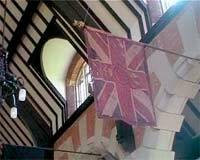 Interior view of the School chapel showing colours of both the Duke of York's and the Royal Hibernian School's hanging. Close-up view of the Royal Hibernian King's colour as well as interesting architectural detail of the chapel. The stained-glass window removed from the Anglican chapel in Phoenix Park now installed near the entrance of the Duke of York's chapel.